It's not enough to tell your audience you have a great idea- you have to show them. So why not put it in the best possible light? 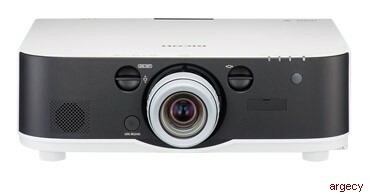 Use the RICOH PJ WU6181N to present a wide range of high-definition multimedia - including movies, schematics, spreadsheets and more - with exceptional color and clarity even in larger venues. Your information will shine in any environment (with any amount of ambient lighting) when you showcase it with the power of 6,200 lumens. Once you have your audience's attention, you can present with confidence knowing every image is displayed in impressive high-definition. Enjoy 1920 x 1200 WUXGA widescreen, high-definition resolution. Use up to 2,304,000 pixels for true high-definition output from television, videos and more. Take advantage of the 6000:1 contrast ratio for clear delineation between every line, shape and color. If your audience can't make it to you, bring your message to them. Collaborate and share information with the Advanced Network Utility, which projects images from one computer to multiple projectors on the same network - letting the same presentation be seen in multiple locations simultaneously. Attendees can even access the presentation at a later time from their own computers. Adjust to your audience and your venue with a wide range of convenient, user-friendly features. Choose from six interchangeable lenses and present as close as 30 inches from the screen - or as far away as 252 feet - without compromising image quality. Display in portrait mode and on non-standard objects for digital signage that stands out. Use the 360-degree installation angle for tilt-free vertical projection. Deliver your information to audiences in more ways. Connect via wired or optional wireless LANs quickly from your PC, laptop or USB-compliant device. Take advantage of the multiple HDMI ports and DisplayPort - to connect to your choice of multimedia and high-definition devices via a single cable. Up to 30" to 500"